This is the eighth book in this hugely popular series and delivers completely. Series fans and newcomers will be equally entertained by Jeff Kinney’s clever interpretation of everyday life. If you have not encountered this series, or the movies, before, the main character and narrator, whose diary this purports to be, is Greg Heffley. Greg is a typical boy in many ways – adventurous, mischievous, and at times utterly hapless and out of luck. At other times, pure genius and the luckiest boy at school. These books remind us what is to be a child trying to fit in and find a yet to be determined niche in the world. In order to connect with young readers and be “believable” children’s authors are required to tap into the expectations and psyche of their readers. This is not that different for any writer, you need to know your audience, but for an adult writing for a primarily much younger audience this can be a tricky pathway to tread. Kinney is a master at this. I remember once being in a writers’ workshop with the wonderful Joy Cowley who encouraged us all to meditate to take us into our own childhoods; to evoke a memory and the feelings associated with that memory; to imagine ourselves as a child of that age. It wasn’t totally unsuccessful and I could see immediately this was a very useful tool for any adult writing a children’s book. But Jeff Kinney seems to have surpassed even this phase – in capturing Greg’s story he seems to not so much been remembering but living Greg’s life. This is powerful and engaging narrative at its best. My own children have devoured all of the books in this series, and although they have moved onto more sophisticated texts, they both paused to read this book cover to cover one evening and loved the humour, and dare I say it, comfort, of another Wimpy Kid book. If you are a kid, have ever been a kid, or a parent, then these books will trigger a memory or two. If you do not find something that resonates with your own life I would be surprised. This particular book is about wider families and the idiosyncrasies that always accompany them; it’s about friendships and the waning and waxing and rekindling of them; it’s about the challenges of being a loving parent and wanting to do the best for for your most beloved children whilst not smothering their individuality. But most of all it’s funny and entertaining. You will laugh at Greg, his friends, his family and yourself. If you don’t laugh at yourself, then you need to try harder. To laugh that is. 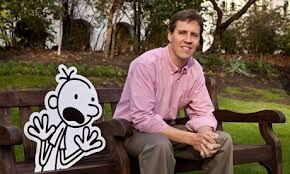 Jeff Kinney has been described as a rock star in the publishing world, and one of the most influential (top 100) people in the world by Time magazine. The key reasons for his publishing success are an amazing ability to tune into the lives of young people; and a very accessible way of writing and drawing that looks incredibly easy, but clearly requires consummate skill. this is a book for everyone, and after you read this go back and read the early books in the series, if you haven’t already. You won’t be disappointed. This entry was posted in Book review and tagged diary of a wimpy kid, Gillian Torckler, hard luck, jeff kinney, Penguin, Puffin, wimpy kid by booksellersnz. Bookmark the permalink.